"Members of the public, you now have one minute to reach Minimum Safe Distance." 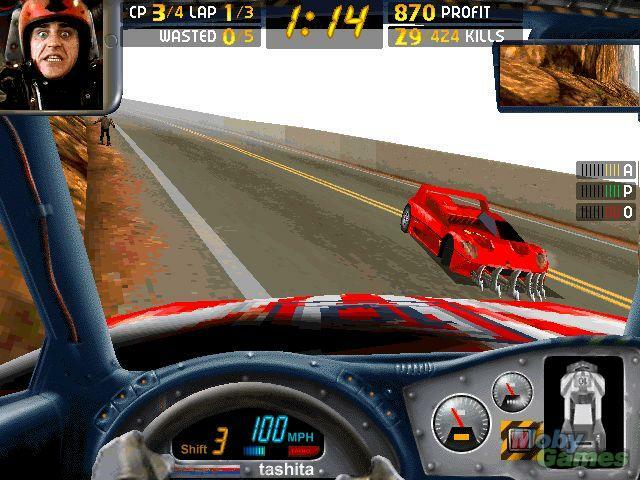 Carmageddon, one of the sweetest dos games ever made, is making a return! The only game where a F50 was fronted with blades! "Horsepower sells motor cars, but torque wins motor races." Carmageddon touches that particular collective nerve that fuses the wholesome popularity of the All-American Racing Game with the homicidal singularity of the 70s cult film into an onscreen experience that can only be compared to the kind of automotive mayhem that a five-year-old wreaks with his Matchbox cars. The object: Win the race. The motive: Greed. The Rules: None whatsoever. Clear all the specified race checkpoints, destroy all the opposing racecars, or vehicularly terminate every last pedestrian bystander within a three-mile radius. It doesn't matter; nobody cares, with the possible exception of the pedestrians. Carmageddon uses a ranking system wherein players start at number 99 and move up, painfully and violently, in rank via a series of six-car races through more than 36 circuits - through the circuits, under them, and in some cases quite a considerable number of feet over them. The game is playable as a cockpit-view racer, but the third-person, follow-cam view is a vastly better way to witness the action, which ranges from the dead-on realistic to the absolutely ridiculous and back again without warning. From the go-flag, the competing cars are at each other (1,000 bonus points to whomever manages to cream the flag-waver on the way out), and for the first few moments the gameplay is usually little more than a dense column of outlandishly-designed vehicles all clashing and sparking and shrieking for pole position (the designers obviously channeled a lot of time into finding really unpleasant, metallic scraping sounds. Every car here can hit the century mark within a few seconds off the line, and the problems begin immediately. Usually it's something like this: One car will break away to one side (either accidentally or with lots of help), begin to slip into a screaming spin, and instantly trigger a chain-reaction meta-collision involving every car on the road, most of the nearby pedestrians and possibly even some of the local livestock - and if nobody takes the hint, you can start the festivities yourself by love-tapping your lane neighbor, cranking the steering wheel or jamming on the brakes for no good reason. The result is berserk, absurd, epic, and comical at the same time - bright, candy-colored racecars sliding into walls, colliding with dense, metallic crunches, pinwheeling up icy slopes, spiraling through the air like two-ton footballs, plowing red swaths through clusters of screaming pedestrians, obliterating cows, plummeting off the sides of bridges, landing on top of each other and getting points for all of it (including cunning stunt and self- explanatory piledriver bonuses). You also never know if some joker held off on the accelerator and hung back there until he could get a good, well-timed ram at whomever may have survived the opening debacle in the most vulnerable condition. And this is almost always before you've cleared the first checkpoint. Sometimes you won't even ever see the first checkpoint. Of course, once you've escaped this messy opening, you can race against the clock to complete the circuit (picking up the odd extra few seconds here and there by picking off an old lady crossing the street), or you can concentrate on turning around, finding the rest of the competitors and destroying them. There are no ranged weapons here (with the exception of a pedestrian ray gun power-up); all the combat is purely kinetic, and what promised to start as an honest race can degenerate into a series of jousts at 150 mph. The collisions are catastrophic, the results ludicrous, with vehicles slamming off sloped terrain (or other cars) and flying for the game equivalent of a quarter of a mile. And, of course, there are bonus points for especially wild stunts, intended or not. The impacts, too, are beyond human or vehicular endurance. No matter - the point is, it's fun. The points you earn translate immediately to money, which can be used for on-the-fly (sometimes literally) repairs. Nobody cares how far in debt you go, as long as you come out with a positive bank balance when the dust settles and the blood dries. And again, fun is the point here - if you're not having fun in Carmageddon, it's your own fault. Drivers can go off-road, explore underground caverns and quite a bit of the local airspace, short-cut, cheat, lay in ambush, trawl for power-ups (some useful, like time-adds, and some just plain silly, like the dreaded pinball mode), go hunting or even - if the mood strikes them - try to win the race the right way, by completing the circuit in record time. Carmageddon is visceral, violent, vehicular fun, no strings attached, no artificial morals or ethics added, and no artificial colors - just black, blue, and red all over. I don't know if I should be happy, or expect it to fail. This game gives me much adrenaline every time I play it. It remains my favorite one even after the release of other good games of this kind. I loved the PC original. I would love that game even without people or zombies. I loved the car physics and damage system.